Post news Report RSS	Alpha 0.5.12 released! Alpha 0.5.12 released. 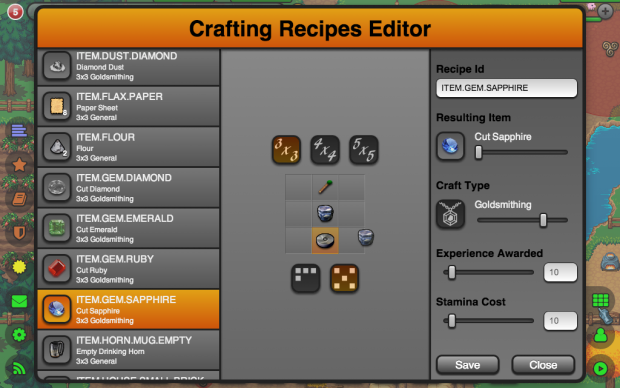 Important features: recipe editor enhancements, new recipes, new items, balancing, and bug fixes. Right-clicking an existing recipe in the left-hand list will copy its configuration, minus id and resulting item into the editor. Right-clicking a recipe slot will copy that slot's contents, which can be placed in any other slot. Middle (scroll-wheel) button clicking an occupied slot will toggle whether or not the item in that slot is consumed in the crafting process. 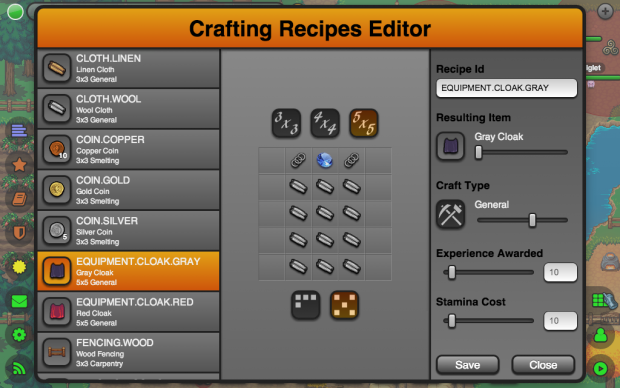 These new additions should now help make recipe editing and creation even easier and less time consuming. Several new items were added in order to provide a grounding for the recently added goldsmithing crafting discipline. These include, silver rings, gold and silver chains, uncut and cut gems (emerald, sapphire, ruby, diamond), dop sticks, diamond dust, and lapidary wheels. White ink and brown pigment have been added as well. Given that gem resource nodes are not currently in the game, uncut gems are available for purchase from Urogenos at the Bibracte market. 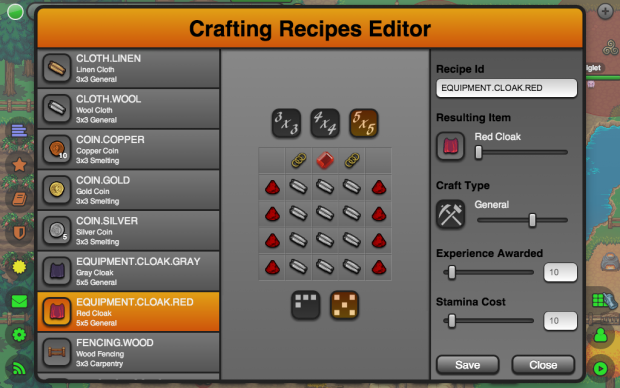 A slew of new crafting recipes have been added, bringing the total to 262 available recipes. As an added bonus, all armor, and clothing (including cloaks) is now craftable! In the interest of making gameplay more challenging and rewarding, several aspects of Lugdunon have been balanced (or nerfed if you will). Using the shovel to transplant trees and flowers no longer confers ownership of the item. Also, when transplanting, there is no wait for regrowth. Planting trees or flowers from seeds remains unchanged. Health and stamina advancement tier effects have been reduced to +1, +3, +8. This is down from +5, +10, +20. Experience awarded for the slaying of zombies has been reduced to 25, down from 50. First pass at item cost balancing is in. 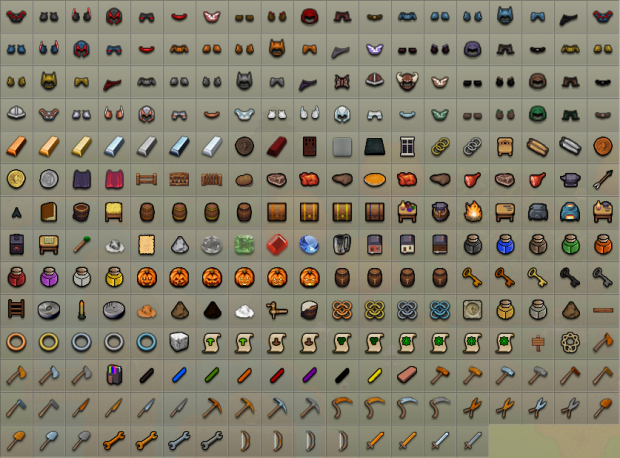 This was accomplished by applying a base cost for all items that are not made via crafting, then calculating the cost of crafted items as a sum total of all materials, and multiplied by a modifier based on the crafting tier require for the crafting of the item. Removed the farmer templates from the create character screen. Hot-fixing an issue that was causing containers to be unusable. Queen Anne's Lace now occasionally drops seeds. Fixed an issue that was preventing the charcoal artist's set from working properly. Use now requires 30 stamina. Fixed an issue that was preventing MUSIC.HOW.THEY.RUN from playing in the default instance. Fixed the 'undefined Earned Achievement: x' issue. Implemented a fix for the unfeasibly long recharge issue. Will need further testing to properly verify if this did resolve the issue. Fixed the goldsmith subpanel wrapper background style. Containers are no longer failing to function when placed in certain locations. Chicken coops and crafting stations are now properly functioning with respect to access restrictions. Fixed an issue with campfires causing issue when attempting the stamina check on environmental damage. Fixed an issue with mis-alignment of the lighting layer at certain locations on the overworld map. Added a new UI flag (deferredRendering) that allows players to enabled deferred rendering. This may improve performance for some players. Server now displays all local addresses discovered on startup. As always, the full change log for 0.5.12 is available here. Looks like you've been a busy beaver with all that you have gotten accomplished. Looks like a long list of great updates.